The Recipe: A homemade graham cracker crust made with two Trader Joe's shelf-stable, easy-to-keep-on-hand products, Cinnamon Grahams and Clarified Butter. Now my graham cracker crusts turn out crisp and sturdy without an overload of sugar and butter – any time pie calls, no planning ahead. Promise that you won't laugh, okay? Or laugh with me not at me? Because here's the thing. I.CANNOT.MAKE.JELLO. Jello! Jello I can live without. But to bake a #PieDayFriday pie every week, a fool-proof graham cracker crust recipe is essential. And I'm picky. Great flavor. Not too much sugar. Not too much butter. But also? Crisp and sturdy, like store-bought graham cracker crusts. I've tried so many combinations of graham cracker crumbs, sugar and butter and while they are "okay" none measured up to my expectations. Add more sugar (other recipes range from 3 tablespoons to 8 tablespoons) and the crust is crisp but tastes too sweet. Add more butter than 4 tablespoons (other recipes range from 5 to 8 tablespoons) and the crust holds together but exudes greasy butter. But I've nailed graham cracker crusts with two Trader Joe's products. If Trader Joe's ever pulls these from the shelves, No.More.Pie. Well, no, it'll be back to regular pastry, my Flaky Tender Pie Crust. But noooooooo! Some pies just demand the crisp, sturdy sweetness of a good graham cracker crust. Besides that? A graham cracker crust means pie-on-a-whim. Hungry for pie? Pie-crust pies demand planning ahead, all that mixing and chilling and rolling and chilling and baking and cooling and and and... The list feels endless some Fridays when, really, I just wanna slap together a pie for dinner. Good news, both these Trader Joe's products are easy to keep on hand and shelf stable. That means they KEEP! They're the only two ingredients in My Favorite Graham Cracker Crust. Trader Joe's Old-Fashioned Cinnamon Grahams – Great graham crackers, these, all sweet and cinnamon-y. Each tub contains enough for 2 1/2 crusts, I usually make two plain graham cracker crusts and then another that's half graham cracker crumbs and half chocolate cookie crumbs. Trader Joe's Clarified Butter (Ghee). – Clarified butter is easy to make with a stick of butter, it's really just the butterfat that remains once the liquid in butter is cooked off. I'm not sure why I bought an eight-ounce jar, way back whenever. But the first time I used clarified butter for a graham cracker crust was out of necessity: it was a Friday and I needed a pie crust and was completely out of butter. The clarified butter in the fridge was months old but I went for it. That first crust? It was my first good graham cracker crust in a long while! Now I keep Clarified Butter on hand all the time and use it exclusively for crumb crusts. For the record, this post is NOT sponsored by Trader Joe's. These two products just helped me finally crack the code for good graham cracker crusts, including in the fragrance department. This graham cracker crust smells so good while it bakes. My 91-year old pie-lovin' father says, "THAT smells good, whatever it is. Smells like butterscotch." P.S. I still can't make Jello. Please send help. Break up the graham crackers with your hands, then drop into a food processor and process until crumbs are very fine and even, make sure there are no larger chunks. Right in the bottle, melt the Clarified Butter in the microwave 10 seconds at a time until it's liquified. Drizzle the butter over top of the graham cracker crumbs, pulse two or three times until the fat is evenly distributed. Alternatively, stir together the crumbs and butter, pressing hard so that the crumbs absorb the butter. Either way, the goal is for the crumbs to become evenly wet and beginning to clump. Bake crust for about 7 - 9 minutes, 8 minutes is perfect in my oven. The crust will appear soft and warm but will harden as it cools. You don't want to overbake the crust, it will be more difficult to release from the pan when you're slicing the pie. Be sure to let the crust cool before filling it. MAKE-AHEAD TIPS If you like, make the crust up to a day or two ahead of time. Let cool, cover and refrigerate. ALANNA's TIPS My mini food processor comes in really handy for small volumes, including making graham cracker crumbs for a graham cracker pie crust. In the mini processor, you need to start/stop a few times; with a large food processor, you'd need to scrape the sides of the bowl a few times. Some bakers like to use the bottom of a measuring cup to compact the crumbs so give that a try too. I like the control that a spoon offers. 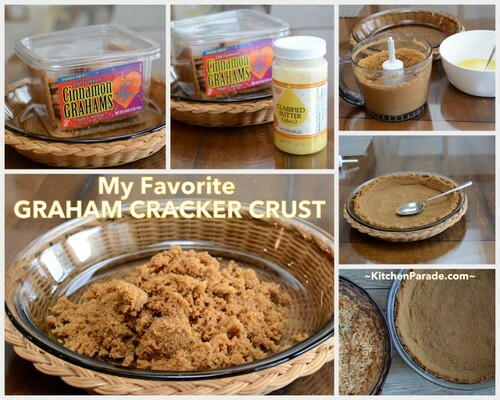 Do you "have" to bake a graham cracker crust? After all, aren't the cookies already baked, won't the butter and sugar hold the crust together without that extra step? I've done it both ways, baking the crust just for a few minutes really compacts the crust, making it extra sturdy. Try it both ways yourself, see what works for you! Quick Nutrition Note I really didn't know how My Favorite Graham Cracker Crust would compare to a traditional graham cracker crust. If TJ's Cinnamon Grahams had more sugar and the clarified butter was pure butterfat, I wondered if my recipe would end up with more calories and Weight Watchers points. It didn't! And while it wasn't the point, I was quite happy about that! Just look! Center – dump wet crumbs into a glass pie pan, they should be like wet, clumpy sand. Then settle in somewhere comfortable, you're going to go all "Dirty Dancing" shaping the crust with the back of a soup spoon, really getting in there. The goal is to evenly coat the pie pan with crumbs. Focus on covering the sides first, then the bottom, then come back to compact and perfect both the sides and bottom. You're going to make several passes, so don't worry about getting everything right in the first or even the second time around. Left – now it's time to compact the crumbs and perfect the crust. Compacting the crumbs is really key, take your time here, really pressing the crumbs to the pie plate. Start with the sides first, pressing the crumbs with the back of the spoon, as you compact the crumbs, gently push the crumbs upward to build the sides almost to the top of the pie pan. When I do this, I'm usually compacting with my right hand, using my left hand to rotate the pie pan for easier access; in this step, I'll rotate the pan at least twice, compacting a little more each time. Once the walls are in place, then compact the crumbs on the bottom of the pan, evening them out at the same time. Center – now the corners, where the crumbs can collect too thick. Use the edge of the spoon to create a sharp edge where the sides and bottom come together. Depending on where you need more crumbs, when creating the edge, you might press the crumbs upward on the sides or downward to the bottom. Well, I'm definitely not going to laugh, because, you see, your thing is my thing: I, too, cannot make Jell-O gel! How helpful is knowing that fact to you? Probably not very. But hey, at least you now know you're not alone in your liquidy-ness! I followed the box's instructions precisely; no jiggle. I thought maybe my boxes of gelatin were old, so I tossed them and bought new ones; no jiggle. I thought maybe my fridge was not cold enough, so I dialed down its temp; no jiggle. I thought, hmm, maybe my mixing bowls were too warm or too cold. I tried metal, porcelain and glass bowls; no jiggle. Then I got desparate. I hired my neighbor—a professional chef—to come over to my house, to "teach me" how to make Jell-O gel! And, guess what? Not even her Jell-O gelled! So, now I say, "I cannot get Jell-O to gel in THIS house." My neighbor, the chef, made my son's Birthday Pie that year, in her home. She made a couple more for him (me?) in subsequent years. Fortunately, my son outgrew his taste for sugary things, grew up and moved out. Perhaps when my husband and I retire to a senior community, I will attempt to make a jiggly gelatin pie again. Only then, it'll be entirely from scratch and will not contain Jell-O nor Cool Whip. Mae ~ Oh my, I am roooooooling on the floor laughing. So glad I’m not alone!